Mike Cooper was born on August 28, 1933, in Montgomery, Alabama. 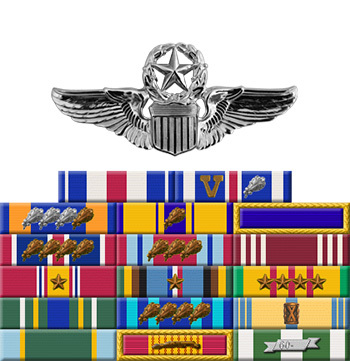 He enlisted in the U.S. Air Force Reserve on June 9, 1951, and went on active duty in the Air Force on January 19, 1953. Cooper was accepted into the Aviation Cadet Program of the Air Force in November 1953, and he was commissioned a 2d Lt and awarded his pilot wings at Webb AFB, Texas, on February 7, 1955. Lt Cooper completed Advanced Flying and Weapons training at Luke AFB, Arizona, in August 1955, and served as an F-84 Thunderstreak and then F-100 Super Sabre pilot with the 614th Tactical Fighter Squadron at England AFB, Louisiana, until May 1959. His next assignment was as an F-100 pilot with the 430th Tactical Fighter Squadron at Cannon AFB, New Mexico, from May 1959 to June 1962, and during this time he deployed to Incirlik AB, Turkey from June to October 1960, and he also served on the Tactical Evaluation Team with the 474th Tactical Fighter Wing at Cannon AFB from August 1961 to July 1962. Cant Cooper served as an F-100 and then F-105 Thunderchief pilot with the 36th Tactical Fighter Squadron at Itazuke AB, Japan, from July 1962 to June 1965, and then as an F-105 pilot with the 334th Tactical Fighter Squadron at Seymour Johnson AFB, North Carolina, from June 1965 to August 1966. During this time he deployed to Southeast Asia in 1964, and from August 1965 to February 1966. Maj Cooper served in the Command Post for the 4th Tactical Fighter Wing at Seymour Johnson AFB from August 1966 to March 1967, and then as an F-4 Phantom II pilot back with the 334th Tactical Fighter Squadron at Seymour Johnson from March 1967 to August 1968. His next assignment was as an F-4 pilot with the 47th and then the 45th Tactical Fighter Squadron at MacDill AFB, Florida, from August 1968 to July 1971, followed by service as an F-4 pilot with the 555th Tactical Fighter Squadron at Udorn Royal Thai AFB, Thailand, from July 1971 to March 1972. During this time he deployed to South Korea in support of the Pueblo Crisis from February to July 1968. He then served with the Aircrew Evaluation Division of the 432nd Tactical Reconnaissance Wing at Udorn from April to August 1972. Lt Col Cooper's final assignment was on the staff of the 4th Tactical Fighter Wing at Seymour Johnson AFB from August 1972 until his retirement from the Air Force on July 1, 1973. Mike was an active member of the Red River Valley Fighter Pilots Association for many years before his death on July 16, 2014. He was buried at Arlington National Cemetery. 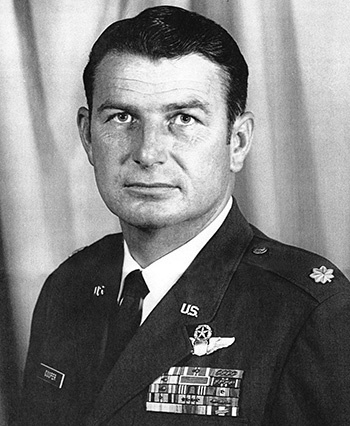 Captain Michael P. Cooper distinguished himself by gallantry in connection with military operations against an opposing armed force in Southeast Asia on 30 September 1965. On that date, Captain Cooper flew as alternate Mission Coordinator while leading a force of twenty F-105's tasked with destroying a vital bridge complex deep within hostile territory. With complete disregard for his personal safety, Captain Cooper remained over the target area, which was defended by Surface-to-Air Missiles and heavy antiaircraft gun batteries, to direct successive waves of F-105's against the target. Captain Cooper's courageous and aggressive action in the face of determined opposition contributed materially to the success of this important mission. By his gallantry and devotion to duty, Captain Cooper has reflected great credit upon himself and the United States Air Force.